On this World AIDS Day, Marco Scalvini and Chris Parkes describe how their new oral history project aims to create a new digital archive that will help researchers better understand the early AIDS epidemic and the new model of therapeutic alliance that emerged, in particular. Oral history is an effective research method to explore and analyse the historical and cultural contexts, interactions, and narratives of those either affected by or responding to HIV/AIDS. However, policymakers and caregivers remain reluctant to consider developing new services or treatments based on oral narratives. The history of HIV/AIDS is marked by numerous victims, but it is also a unique story of a highly effective social movement around public health issues. One feature of this has been the development of an extensive network of support between patients and activists, together with the involvement of clinicians. This mobilisation achieved concrete changes in medical and scientific research, health care delivery, prevention, and the rights of patients, introducing a new and effective model of therapeutic alliance. However, in recent years perceptions of this history have been blurred or completely lost amidst advancements in medicine and social acceptance. Nowadays, new and more effective treatments have meant HIV has become a manageable illness, while concerted educational campaigns have fought back against anti-HIV social stigma. In a testament to the extent of these advancements, people often overlook how the national and international response to AIDS was made possible by the passionate work of dedicated individuals who challenged prejudices against people living with HIV, educated their communities, and fought for resources and research. 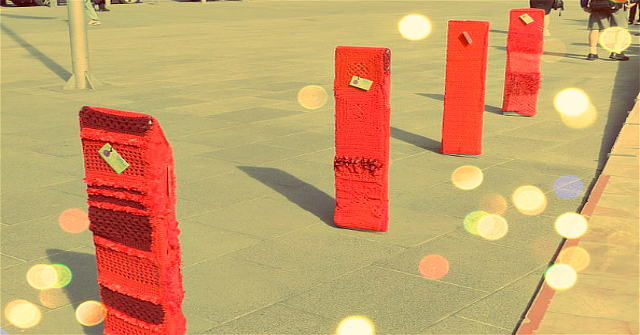 Image credit: Yarn bombing – World AIDS Day bollards by Twilight Taggers. This work is licensed under a CC BY 2.0 license. In order to relate the stories of those who did not live through this crisis and also to inform those unaware of the mobilisation of UK activists and caregivers that fought against AIDS, we are working on an oral history project to analyse how political and social mobilisation for access to treatment developed a new model of therapeutic alliance during the UK AIDS crisis. Specifically, our goal is to create a digital archive made up of testimonies from the patients, activists, physicians, scientists and nurses who represent the history of AIDS in the UK. The realization of this collection of personal narratives is a challenging project to show how oral histories might be elicited and used to inform health policymakers and improve access to treatments for new diseases. The first stage of this project is limited to the contributions of those whose work was undertaken in London, an early epicentre for both the recognition of the disease and the grassroots response to the epidemic. Our goal is to make available the first online release of this digital archive by 1 December 2018, the 30th anniversary of the first World AIDS Day. how patients lived and survived the crisis. In this way, these narratives will allow us to reconstruct the patient-professional contact and chart how the medical profession changed over time. Although oral history offers key conceptual and methodological challenges to public health research, both in the medical humanities and social sciences, prestigious academic journals in public health are reluctant to publish non-quantitative work. Moreover, policymakers, caregivers, and funding institutions are similarly reluctant to consider the development of new services or treatment approaches based on oral narratives. Further, in a paradigm where public health is driven so absolutely by cost benefit analysis and systematic review of policies, asking scholars and policymakers to take seriously the concept of therapeutic alliance induces a degree of kneejerk scepticism. An oral history archive on HIV will be the first of its kind in the UK and would fill a conspicuous gap in historical and medical accounts of the epidemic. Extensive oral histories have been compiled in North America (see the ACTUP Oral History Project at the Harvard College Library), while UK-centric accounts have been either limited in geographic scope (see Untold Stories: Leicester LGBT Centre Oral History Project and Queer in Brighton: Our city’s unspoken LGBT history) or have dealt with HIV only incidentally (see Observing the 1980s in the British Library Oral History Collection). Moreover, existing oral histories have tended to exclusively interview either medical professionals or community activists, ignoring the interactions between these groups and amongst other stakeholders during the epidemic. the grounding for future explorations of themes that emerged throughout the course of the project, such as treatment, medicines, and care provision during a public health crisis. This project is expected to be a valuable resource for scholars, students, caregivers, policymakers and activists in public health far beyond the immediate subject of HIV/AIDS. At the same time, we also aim to provide a platform for supporting a new generation of therapeutic activists by offering a broader reflection on how the AIDS mobilisation developed a new and effective model of therapeutic alliance between medical professionals and stakeholders in the community. Marco Scalvini earned a PhD in Media and Communication and his research agenda entails HIV/AIDS, immigration, and public health. His approach to research focuses on digital methods to reveal, interpret, analyse and present complex issues, concepts, narratives and data. He has published two papers on how antiretroviral drug advertising has changed the representation of sick bodies. Currently, he is investigating the impact of pre-exposure prophylaxis (PrEP) on HIV prevention. Recently, he wrote an article in the Guardian urging health providers and researchers to offer clearer evidence about chemsex rather than sensationalism. Chris Parkes is a historian based in London. He received a PhD in International History from the London School of Economics for his thesis on the life and career of former US Undersecretary of State, Sumner Welles. His research focuses on 20th century US political history and sexuality. He teaches history and international relations at the London School of Economics and King’s College London. Great to see you are doing this project -I’ll be really interested in ways you find to use what we have learned to influence activism in health policy today and for the future. You mention the British Library collections above as incidental, but we did more, admittedly in a small way. From 1995, we put together a collection of about 30 long life history interviews with people with HIV titled ‘HIV Testimonies’ and ten years later, we revisited those who were still alive and did some follow up interviews, interested particularly in documenting the dramatic changes in prognosis for survivors over this period and longitudinal aspects of methodology. We also added about 10 new interviews at this time with people who were newly diagnosed. These interviews were with key activists and ordinary people living with the virus, so perhaps they could be useful to your project? Due to confidentiality issues, some were closed for public use, but the rest were on open public access and they have been well used. Given the passage of time, some closed interviews are now available. Sian also undertook 2 oral history projects with people with haemophilia and later with family and carers. Just this summer, she and her team at the University of Brighton have HLF funding to interview 60 key health professionals involved at the time of the emergence of HIV/AIDS in the UK. We are just starting those interviews. So it looks like perhaps we should talk and pool some resources? Let me know if you would like to follow this up.